​Leave a legacy with the “Buy-A-Brick” program. 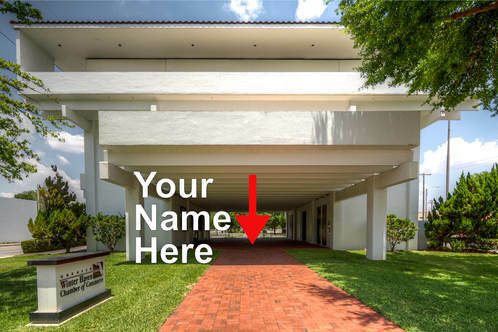 For only $125, buy a brick engraved with your name, your company name, a civic group name or a loved one’s name recorded forever in Winter Haven History. These bricks will be on the floor of the open “concourse” area of the Greater Winter Haven Chamber of Commerce building at 401 Ave. B NW. Proceeds benefit the Winter Haven Chamber Foundation, a 501(c)3 organization. The Chamber concourse is located in the same place the rail lines ran through the center of the community, paving the path for Winter Haven commerce to flourish for over 100 years. Order by December 10 to receive a certificate to be given as a holiday gift!